TOTO Neorest Vs KOHLER Veil – Astounding Features Comparison - Toilet Found! Can’t Decide Between A TOTO Neorest And KOHLER Veil Toilet? The biggest question here is, which TOTO Neorest model is most comparable to KOHLER Veil? To answer this ($4000) question, you will have to look at the features and specification of both models. And their respective user reviews out there should also be taken into consideration. TOTO has six Neorest models for the US market currently. Out of which four are floor-mounted. And KOHLER Veil has two version, a wall hung and a floor mounted model. The other two KOHLER intelligent toilets are the Numi and Karin. But let’s focus on the KOHLER Veil smart toilet for now. As for which toilet is better looking, let’s leave this argument out in this comparison review. That’s too subjective for an objective discussion. But if you must state your position you can leave a comment below. A comparison review is useless without comparing the features of the toilets concerned. And a meaningful review is understanding how each of the features works to provide you with the values and benefits. But you are not about to read through all the features of both toilets. In the case of TOTO Neorest, there are easily over 20 features to look at among the 4 Neorest models. So let’s not make this review seem like an owner’s manual for both toilets. It’ll be crazy to go through every single one of them because some of the differences may be too insignificant for your attention. So only features that impact performance and user experience between the toilets will be discussed. The first impression you get with the KOHLER Veil intelligent toilet is its compact size. The overall length is only 26-1/8″. You might think this is perfect for your tiny bathroom with limited space for a regular size toilet. But hold your horses, don’t hit the buy button just yet, or you will be swearing like a sailor later. Though the overall length of this Veil toilet is just 26-1/8 inches, you will need an additional 2-1/4″ of clearance space from the wall. So it actually takes up more than 28 inches of floor space (front to back) when fully installed. This gap is due to the location of the bowl outlet which is more towards the back of the bowl. As a result, when installed on a 12″ rough-in the overall front to wall space becomes 28-3/8 inches. So, is this a design flaw that leads to the 2-1/4″ clearance gap? So it is deliberate to ensure the toilet gets enough clearance space from the wall if the rough-in is at least 12 inches. On the other hand, the TOTO Neorest model with the shortest length, model 550H, is 27-5/16 inches long. No need for a 2 inches clearance space necessary. The other model with less than 28 inches in length is Neorest 500H; it’s installed length is 27-5/8 inches. 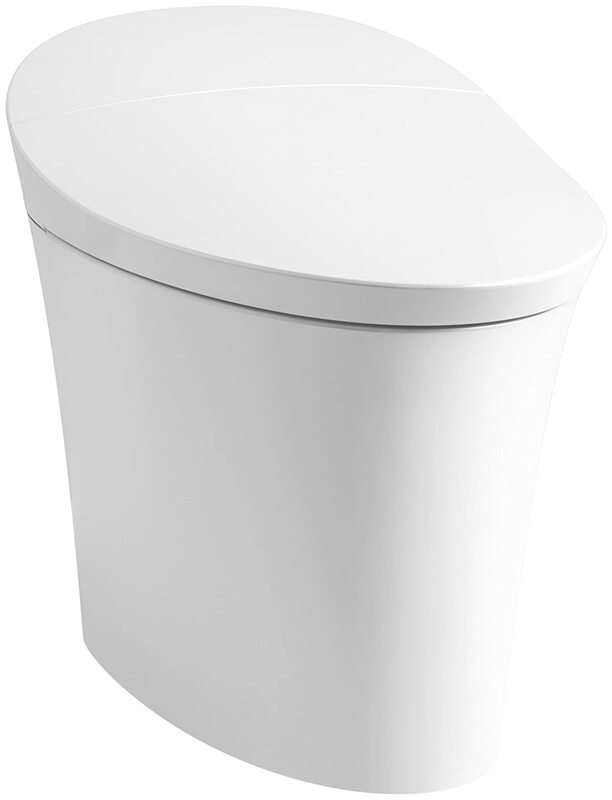 The Neorest 700H and 750H are regular size toilets with a length of 31-7/16 inches. Both TOTO Neorest and KOHLER Veil are dual flush toilets. The flush volume of the KOHLER Veil K-5401-0 is 1.28 GPF and 0.8 GPF for a full and light flush respectively. And there are a 28% savings on water consumption to clear solid waste if you choose the TOTO Neorest. 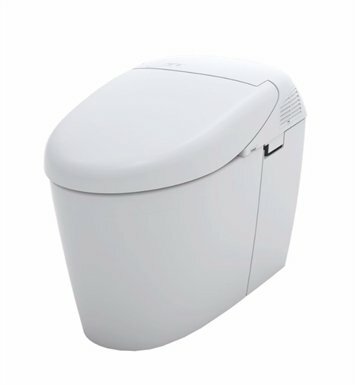 At 1.0 GPF and 0.8 GPF dual flush capacity; it makes the Neorest an Ultra High-Efficiency Toilet (UHET). Nevertheless, if you chose the KOHLER Veil, you are still doing your part to protect the environment anyway, so don’t feel bad about it. It meets the EPA’s WaterSense program requirement. So don’t be shy to say it is a water saving toilet. Just that the TOTO Neorest toilet can save you more water that’s all. Trap Passageway – That’s KOHLER language for Trapway. And the passageway diameter of the Veil is a narrow 1-15/16″. The industry standard is 2 inches. Well, you may argue it’s just 1/16″ smaller, no biggie of a deal. Sure, and TOTO’s 2-1/8″ is just another day of no-clog flushing in the bathroom. But to be fair, the bottom line is how well the toilet flushes waste in a given volume. So taking a look at the MaP rating of both toilets is probably the next best thing to do. But first, let’s have a little understanding here. It is widely known that the bigger the trapway diameter, the more material mass it can move. And common sense has it that a narrow trapway is more prone to clogging versus a bigger trapway. So between 1-15/16″ (KOHLER Veil) and 2-1/8″ (TOTO Neorest), the difference is a negligible 3/16″. And how does that affect the MaP rating? KOHLER Veil Intelligent One-piece Toilet, or more precisely, KOHLER K-5401 model does not have a MaP rating. Whereas TOTO’s Neorest series of smart toilets have a MaP rating of 800. Even the lowest end model of the Neorest line, the 500H has a score of MaP 600. Period. Don’t believe? Download the complete list of MaP rated toilets (as of 25th August 2017) and see for yourself. Not a particularly important feature, but good to know if it means an advantage or disadvantage when you are going to splurge four grand on a toilet. Of course, a bigger water surface means it is a better filter for odor and better at reducing bowl streaking. The water surface area of KOHLER K-5401 is a reasonable 7-15/16″ x 5-5/8″ versus TOTO’s 8-3/4″ x 7-1/14″. But don’t worry too much about it. Whichever sides you take, both have the automatic deodorization function. So size doesn’t really matter here if you are concerned about odor. Yeah, that could be a problem with a small water surface area. A bigger water surface is always desirable, and it helps to reduce streaking. Plus a good glazed surface, like TOTO’s CeFiONtect, just makes flushing a whole lot cleaner and more efficient at reducing skid marks. Watch a short video of how TOTO’s CeFiONtect surface glaze works to reduce waste smears and skid marks. KOHLER might seem to have the edge over TOTO in this regard. But on a closer look, KOHLER’s UV light system looks more like a science experiment of a fifth grader. No wonder it cost only $4000 versus a whopping $10,000 for the high-end TOTO Neorest 750H. Alright, just in case you aren’t familiar with TOTO’s Neorest line of intelligent toilets – the only floor-mounted Neorest model that has the UV sanitizing system is the Neorest 750H or MS993CUMFX#01. And the Actilight, the name of TOTO’s UV system, is used differently and more elaborate for a complete sanitization. And it focuses on the dirtiest part of the toilet, the inside bowl surface. So is the TOTO Neorest 750H a good match for this KOHLER Veil intelligent toilet? Obviously not. The Neorest 750H is a different beast, a different class above the Veil. The UV light of the KOHLER Veil K-5401-0 is only used to sanitize the wand. And the UV sanitization can be programmed to take place once every 24 hours, or anytime when you hit a button on the remote control. But that’s not the only process Veil uses to sterilize the wand. After every use of the toilet, the wand is cleaned automatically with electrolyzed water. On the other hand, all TOTO Neorest smart toilets use only electrolyzed water (or eWater+) to clean and disinfect the wand before and after every use. Is the UV sterilization of the wand necessary on the KOHLER Veil, since there is electrolyzed water to clean, rinse and disinfect the wand? The advantage is, of course, it adds another level to prevent any chances for bacteria growth on the wand. The drawback is an additional part to maintain and add cost to something which may be redundant. The dirtiest part of the toilet has to be the inside bowl surface, obviously. And if you think the regular flushing after every use is good enough to clear all the waste down the drain, you are dead wrong. Some residual waste may have withstood the flushing and remain in the bowl. These leftover waste can be so tiny that is not visible to the naked eye or hard to spot, and they are a source of bacteria growth. Unless you clean the surface weekly or maybe even daily with a chemical-based sterilizing solution, you can’t be sure that the bowl surface is free of odor-causing bacteria. That’s where the Pre-mist & After-mist feature of TOTO’s Neorest toilets can seriously save you precious family bonding time. Pre-misting is the spraying of electrolyzed water onto the bowl before use. This film of eWater+ on the bowl surface has shown to improve dirt and waste elimination by as high as 80% with each flush. And with the proprietary CeFiONtect glaze, it further reduces residual waste from adhering to the bowl surface. Hence, you get a cleaner flush every time. What follows is the After-mist which starts twenty-five seconds after the flush to sanitize the bowl of any leftover micro waste. And when nobody uses the toilet for the next 8 hours, the misting kicks in again. It will keep misting the bowl with eWater+ on an 8-hour cycle when nobody uses the toilet. By the way, both Pre-Mist and After-Mist functions are automatic. So no worries about losing even one second of family bonding time. And don’t forget to leave the power on for the after-mist to function if you are going for a vacation. You certainly do not want to come back to a foul smelling toilet after a fun-filled holiday. As for the KOHLER Veil, it sure needs more cleaning and sanitizing features than just the wand. While you may be marveling over the automatic functions of these smart toilets, you should know they all operate on electricity. And the main drawback across all intelligent toilets is a power failure. That’s the worst that can happen even to the highest end model of any range. So most of these intelligent toilets will have a backup flush. One which will allow you to pull a last life-saving flush before power gets who-knows-when restored. So please take note that for TOTO Neorest 500H & 550H, there is no backup flush function you can rely on to pull a last one. Whaaat!!! No backup?!? !…what the…Is this a mistake? Hey, chill. There’s no mistake here. Quite frankly, even with the backup or emergency flush, you probably still need to use a bucket of water to empty everything in the bowl. Remember these smart toilets are also known as tankless toilets. There is no tank to hold any sizeable amount of water to give you a regular flush. So don’t expect the same flushing power and volume from a backup. And if TOTO were to include an emergency flushing system into these two Neorest models, it will need space in the bowl for the flushing mechanism. That will lead to a larger bowl. So perhaps TOTO wants to keep their overall size compact to cater to those with a small bathroom. Which is logical given most restrooms in Japanese homes are super small. But KOHLER Veil, with a 26-3/8 inches bowl, can afford to have a manual flush on the side. That simply squash whatever reasons TOTO has for not including the backup flush for the two Neorest models. What a shame. As mentioned right at the beginning, there are 4 Neorest models versus the one and only KOHLER Veil here. And the Neorest 750H is not in the same league as the Veil, so that leaves you with 3 Neorests. And if size is an important consideration, then you are down to two Neorest models – Neorest 500H and Neorest 550H. That is because the Neorest 700H, at 31-7/16 inches (length), is a regular size toilet. Or rather, the size difference is too large compared to the two other Neorest models. So between the Neorest 500H and 550H, which is a match for KOHLER Veil? If you look at the specs of the two Neorest toilets, there is hardly any difference. The only way to choose is your personal preference for the exterior or plainly based on price. The advantages and disadvantages of the TOTO Neorest here refer only to 500H and 550H since their size and features are deemed as the closest to KOHLER Veil. 2 inch clearance from wall. = Indicates a better feature than the competition. Last but not least, the owner’s manual is where you get a total understanding of how to work the features and what to do when you run into any problem. In the case of KOHLER Veil, the owner’s manual is 56 pages thick. But beyond page 18 it repeats itself in French and Spanish. On the other hand, TOTO Neorest has 64 pages (for 500H) and 36 pages (for 550H) of solid information in English and illustrative graphics. Its table of content will point you to the right page in a flash without having to flip through a pile of warnings and disclaimers. And it’s always a good idea to read the owners manual to understand the features better before a purchase decision. So here you are, the owners manual for all the smart toilets mentioned here. So having seen the features, advantages, and disadvantages of both toilets, have you got an idea which smart toilet model is ideal for you? It shouldn’t be a difficult decision. You just need to look at what features are important to you and choose a suitable model. Of course, if you have a smaller budget, there is the TOTO Neorest 500H which has the same features as the more expensive Neorest 550H. And if a taller bowl is a must for you, the Neorest 700H is the only model here that is ADA compliant, and within the $4000 bracket. But it is still a few hundred dollars pricier than the rest. Or is it? And do note that it is a regular size toilet, which may be a little squeeze for a small bathroom. The most desirable features here are the PreMist & AfterMist by TOTO. Highly recommended and you will love how it can keep the bowl clean all by itself. Of course, if you are a die-hard KOHLER fan or a patriot, then it is very clear which way you are going to swing. So that’s it. And thanks for reading this TOTO Neorest vs KOHLER Veil review. Have a point or two to add? You are most welcome to leave your comments below. Add to Flipboard Magazine. I think design-wise Kohler Veil wins hands down… it was a big surprise that Veil didn’t have MaP rating though. Well, as I am upgrading my bathroom, I will see if Veil will disappoint me or satisfy me. Great review though. Tons of facts and accurate comparison. All in all, smart toilet is way over priced for any brand but it is to satisfy the ones who can afford in their own desired way. Thanks Young. No Numi vs NX1 review for now because I think they are not on equal footing in terms of features. And I don’t consider having the capability to play music is a toilet feature to begin with. I understand the Kohler service is a nightmare. Took my plumbing supplier 6 months to resolve a problem with the Veil. So disappointed, as I like the design better than the Toto. We’ve had a ToTo Neorest 600 for approximately 11 years, there are zero service technicians in our area. With Neorest, over time the air circulation deodorizer stops working and the unit becomes extremely smelly, to the point of you not wanting to use it. This deodorizer starts the moment the seat raises. Otherwise, you must disassemble the entire seat and send to the Mfg which will cost approximately $500 or more, then wait for them to repair and send back to you. This is ridiculous to me, that they sell high tech toilets at the price tags they do and you are without any trained or qualified technicians to work on them. Thanks for sharing your experience. Looks like a saturated carbon filter you have there. If the fan motor is still working fine then replacing the filter might just solve the problem. You may want to check with a Toto distributor near you if they have the replacement filter or at least order one for you if they don’t have the stock. That will not cost you $500 I’m sure. You may have to wait a while since you are having a discontinued model. But if the fan motor is fried, then that’s probably about the cost to fork out.